New Zealand is an exciting wine region and a promising area to explore for value hunters. In addition to their notable Sauvignon Blancs, they're producing excellent Chardonnay and Pinot Noir in addition to Riesling, Pinot Gris and Gewurtztraminer. 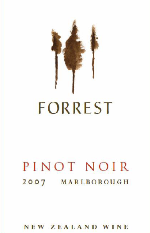 I had a chance to taste through 3 wines from Forrest Wines over the course of a week. My notes are below. I don't think I've ever seen a wine label so spot-on in its description: "Lime sorbet and juicy green apples...some lovely sweetness balanced by the fine acidity..." Indeed. 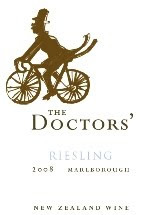 This was the first of the 3 bottles I tried and I was on a major Riesling kick at the time. Comparing this wine to (what else) a German Riesling, this one didn't quite have the density or "zing" that my favorite Germans bring. A touch of sweetness for sure, which I liked, but more flavor and weight and I would have enjoyed it more. Still, a very enjoyable bottle. Okay, now we're on to a grape variety that New Zealand has done very well with. Although the classic New Zealand Sauvignon Blanc delivers intense, pungent aromas, this wine showed restraint. In discussing this wine via E-mail with Trevor Loomis from Forrest Wines, he described the wine as one that bucks the trend in New Zealand Sauvignon Blancs and goes for a more Loire Valley style wine. Yeah- I can see that. I could easily mistake this for a Sancerre blind. Very clean, nice acidity, and enjoyable citrus aromas and flavors. Really nice stuff. I'm thinking of going on a New Zealand Pinot Noir kick after trying this (and other wines) recently. If I tasted this wine blind and had to guess whether it was from Burgundy, California or Oregon I'd likely guess Oregon. It's lower in acidity and more full-bodied that red Burgundy, yet it brings enjoyable mushroom/forrest floor aromatics that I really enjoy. I don't find these characteristics in most California Pinot Noirs I've tried. I would have rated this one a little higher if it delivered more flavor, but what I tasted I liked very much. I'd like to thank Forrest Wines for giving me the opportunity to taste through these wines. 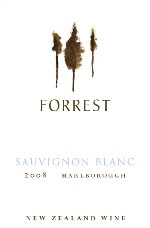 Question of the Day: Have you seen Forrest Wines in stores in your area? Ever had 'em? What did you think?